Tourism with a twist? Tired of the same old tours and droning guides? Alvin Nicholas’s book on manors, mansions, castles, nooks and crannies, reveals there’s more to Britain than meets the eye. This is definitely not your average castles tour book. It’s an excellent resource for tourists, sleuths and adventurous spirits who are interested in more than the same old sites and regurgitated historical facts. You can take this book along with you and be your own guide on your next trek through Britain. Nicholas, who is a certified Mountain Leader and lectures on heritage management, has put together a compact, yet comprehensive, guide to popular and lesser known historical sites around Britain. It’s jam packed with incredible stories, great escapes and ghostly wanderings. What’s also fantastic is that it covers more than one period and building type: Medieval, Tudor, Stuart, Georgian, Regency and Victorian; private homes, castles and hideaways. It’s all here in under 200 pages. It’s a quick read, and neatly divided into regions: South West England, Southern England and London, East Anglia, Central England, Northern England, Wales, and Scotland. This is especially useful if you’re planning on visiting a specific area, or passing through one and want to know what’s nearby and where to stay. The book covers the basics and provides an overview of what’s open to the public, and when, allowing you to tackle the sites in manageable chunks. Although not everything is open to the public, Nicholas still provides a worthwhile read full of interesting tidbits, exciting tales, or little known facts about each place. My only complaint is that the pictures in the book are all black and white. While I like black and white photography, I would’ve liked to see a splash of colour between the pages as well. Other than that, this is really an outstanding little book. Aside from being a great reference guide, it’s the stories that I liked most. 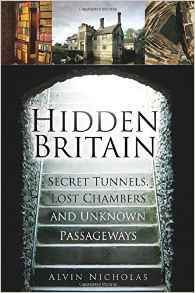 The book has a section devoted to priest holes, passage ways, tunnels, and grim discoveries. As you go through the chapters, each place has a bit of interesting history about the period and the site’s importance, followed by a snippet that isn’t common knowledge, like a family scandal, a dark secret, hiding places and local legends. There are many great stories, but my favourites have to do with the priest holes that recusant Catholics created during the Tudor and Stuart period when they were hunted and persecuted for refusing to accept Protestantism. Some of the tales here would make great movie fodder, e.g., miraculous escapes, political intrigue, eventual capture and murder. I will definitely keep it as a reference and start planning my travels around Britain wth the help of this book. I travel a lot, so it’s nice to have something handy that’s thorough, yet portable, and speedy to read when I’m looking for places to see on the fly. If you’re a history buff, Anglophile or just planning on visiting Britain, this is a must-have guide for your trip.